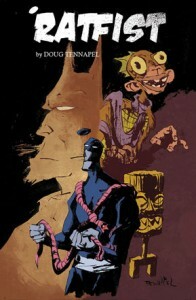 And that is creator Doug TenNapel’s desire, not my own (though it is certainly a sound one). In the upcoming Episode 253, Steve and I put Ratfist up against Battlepug to see who wins the Internetiest Webcomic Title Of All Time and came away with a realization that we loved both comics equally, though for very different reasons. I also got to tell Steve in that discussion that Ratfist was ending this week, which he conceded to be a good thing as so many comics seem to wear out their welcome. With 150 updates in the bag, Ratfist has called it quits, but not only can the comic be found in its entirety at the handy dandy, easy-to-remember URL, but a collection featuring bonus content and landing at 176 pages drops later this year from Image Comics (front cover, pictured left). Doug encourages people to tell everyone they know about the comic and for existing readers to pick up the book to show the big publishers that putting out books based on webcomics is a great idea. Can’t really say I disagree with any of these sentiments.